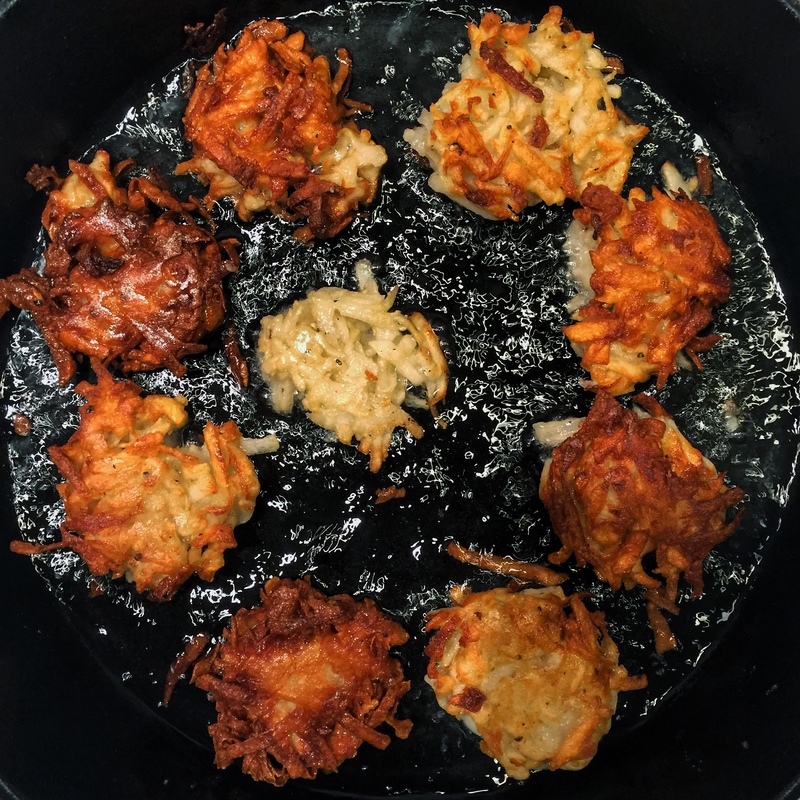 These potato nests are like shredded bundles of fried potato shoestrings. Do I have your attention? You’ll note a decidedly shortingredient list. The recipe is a blank canvas onto which you can free to improvise additions like adding a handful of chopped herbs (chives, dill and parsley are nice) or shredded carrots or beets. But I caution against getting too fussy with it. I tend to err on the side of keeping it simple, and here simplicity will not disappoint. I like to serve these with a spoonful of crème fraiche that’s been mixed a grated garlic clove and a squeeze of lemon. If you’re feeling real fancy, you could add a dollop of caviar and no one would complain. Mix together the shredded potatoes, brown rice flour, salt, pepper and nutmeg. Work quickly as the potatoes will begin to oxidize after they’ve been shredded. In a medium sized, high-sided skillet, add enough oil to come up about ½” and heat the oil over medium flame. The oil is ready when you a small scoop of shredded potato sizzles when it hits the oil. If not, let it heat a bit more. Scoop small spoonfuls of shredded potato into the oil. I use a small ice cream scooper to portion the potatoes into the oil, but you could easily use a spoon. Once the potato hits the oil, spread the top a bit so you get a more flat disc as opposed to mini-mountain. This ensure even cooking. Once the potatoes are browned, roughly 2 minutes, flip them over, taking care not to burn yourself with hot oil. If they’re coloring too quickly, adjust the heat. Transfer to a sheet tray with a rack to drain excess oil. Try not to eat them all as you fry. Here’s what to cook when you don’t know what to cook. It’s easy and relatively versatile. You can make roasted tomato sauce in the winter months from canned tomatoes, and once summer comes you can lighten it with this simple fresh tomato sauce that takes all of 40 minutes to make. People ask me all the time: What’s your favorite thing to cook? I invariably say anything with vegetables. But I fell in love with pasta al pomodoro when I was cooking in Rome, and I doubt I will ever tire of it. There is something so heartbreakingly beautiful about a dish like this, humble yet unapologetic in its bareness. Tomatoes, olive oil, garlic, basil and parmigiano. It goes without saying that these five ingredients should be the best that you can afford. It makes all the difference. When you don’t know what to cook, cook something simply and without fuss. One of my favorite chefs says: The dish is complete when there’s nothing left to take away. Each ingredient must bring something to the table, and don’t tire your diners by tossing in needless add-ons. Simplicity always shines when done with care. Heat an 8-quart pot of water to boil for pasta. In a medium saucepan, heat the garlic in the olive oil over moderate heat. Let it cook gently – a little color is fine but you don’t want the garlic to brown. As you see it begin to turn translucent and soften, turn the heat up to medium-high. Once the garlic begins to dance in the oil, add the tomatoes. You should immediately hear a sizzling sound as the tomatoes fry in the oil. Let them cook undisturbed for 30 seconds before stirring. Turn the heat to medium and let the tomatoes cook down and begin to thicken. Stir intermittently to prevent the sauce from scorching. It usually cooks for 40-50 minutes. Once the tomatoes have fully disassembled and amalgamated with the olive oil, it’s finished. Take it off the heat and blend it using a food mill (to maintain some structure and body in the sauce). Alternatively, if you don’t have a food mill, you could use a blender, but the sauce will turn an orange-ish color. Once the pasta water is boiling, salt it generously and drop the pasta in. Undercook it by 2 minutes so it can finish cooking in the tomato sauce. Drain the pasta, saving some of the cooking liquid. Heat ½ cup of the tomato sauce in a sauté pan. Transfer the pasta to the sauté pan and cook for another 2 to 3 minutes, stirring and adding a little pasta water to achieve a slightly loose, saucy consistency (the pasta will continue absorbing some of the sauce as it finishes cooking). Once the pasta is cooked to al dente, toss the pasta vigorously as you shower in grated Parmesan and a handful of basil leaves. If it starts to clump together, add a little more tomato sauce and pasta water. Serve with extra Parmesan sprinkled on top. This recipe will make an ample amount of sauce, but it freezes beautifully. I also like to eat this sauce with polenta and a softly fried egg or make an Italian-style shakshuka. The trouble with abundance is it often feels unearned, and getting something you’ve longed for can feel oddly anticlimactic. The height of summer is the time I long for all year. While I’m shoveling snow struggling to stay warm, I remember with sweet fondness the utter salvation of an ice cream cone or the relief of passing through doorways into an air-conditioned living room. In the depths of winter when I can’t bear the idea of eating another parsnip, I dream about farmer’s market stands covered with produce of every color. The shift happens so fast. Suddenly the kitchen counter is covered with tomatoes. Last week I got so much zucchini in my CSA box I panicked. What will I do with all of this? In those moments of dreams realized, abundance can feel more like a cross to bear rather than a wish granted. Such is the nature of longing. Despite the suffering it creates, living life in anticipation of what’s to come can, paradoxically, feel quite good. I’m reminded the profound and tremendous longing I’ve felt for romantic partnership during extended periods of aloneness. In those times, I have been all but certain that there could be nothing sweeter and more satisfying than finding someone with whom to be. Then it happens. A few weeks pass before I’m reminded, inevitably, that relationships are hard and actually it was quite nice having Friday evenings to myself and my pajamas. Real life can never measure up to our deepest longings because longing itself is a mental manifestation that can morph and change. It isn’t beholden to the truths of reality. Things are further complicated because there is always something else to long for. Like a game of whack-a-mole, longing can never be fully satiated. What’s the antidote? I usually start by taking a deep the breath. I make mental notes of my surroundings, like the way the morning light slices across the stove in my kitchen illuminating a sliver of the tea kettle in such a way that can only be described as breath-taking. I take notes about what I see, even if it’s just the banality of my everyday routine. David Whyte wrote: Alertness is the hidden discipline of familiarity. The natural world, fantastic and awesome in its innate capacity to produce, can also be a disorienting and disquieting. Things move at their own speed. There can be no willing things to grow before their time simply because you’re craving eggplant parm. Cooking in tandem with the natural world builds the mental muscles of dexterity and agility. You necessarily must embrace change and move with it in order to get to achieve your desired outcome., which should always include a delicious meal. Such skills are in short supply and will serve you well in just about every other area of you life. Truthfully, if you want to learn how to be a better lover, friend, partner, sister, advisor, mentor, human being, starting cooking seasonally. Here’s one zucchini recipe I return to again and again, and it’s a technique that lends itself well to other vegetables such a romanesco or broccoli. Stra in Italian means “very”, so stracotto means “very cooked”. Successful execution hinges on a generous amount of olive oil to start and just the right amount of additional liquid (water) to inhibit any scorching but not too much as to steam the vegetable. The result is an incredibly luxurious mass of cooked down vegetable that shines on toast, in pasta or as the base for a piece of seared fish or grilled chicken. Last night I tossed this with some malfatti, pecorino and breadcrumbs. Warm the olive oil and garlic cloves over medium-low heat in a wide pot that’s large enough to accommodate the diced zucchini. Once the garlic has begun to color slightly, 4-5 mins, add the chili flake and let cook 30 seconds. Turn up the heat and add the zucchini. It should sizzle when it lands in the pan. Add a couple tablespoons of water and let cook for 5 minutes before sprinkling a generous amount of salt over the zucchini. Stir well. Cover the pot partially and cook over medium heat for 5 minutes. Uncover the pot and stir, taking care to scrap any lingering bits off the bottom of the pan. Continue cooking uncovered and stirring occasionally as the zucchini releases its liquid and begin to collapse on itself, about 20 minutes. If the contents of the pan start sticking to the bottom, add a couple tablespoons of water. Continue cooking until the mass begins to come together. It should look … very cooked. Toss with pasta, spread on toast, or eat over grilled polenta. This also happens to be a truly spectacular sandwich spread with a few thick slices of mozzarella and fresh tomato if you have them on hand. It’s been a month since the news of Anthony Bourdain’s sudden death landed in my inbox. When I heard the news on a Friday morning in June, I was shocked by how little emotion I felt. Certainly I felt sympathy for his family, but I mostly trudged through the rest of my day thinking very little of it. It was only recently that the slow, dull ache of sadness set in as I reflected back on his work and how it shaped me as a cook, a writer and a person. I recently listened to this excellent interview with him and Marc Maron from 2011 and his incantatory voice lulled me back to a place of deep reverence and appreciation. The way he describes the places he visits through their food landscape is a beautiful manifestation of that age-old Brillat-Savarin quote: Tell me what you eat; I will tell you what you are. Reading and listening to him embeds in me a great sense of urgency to Pay Attention. After all, cooks are story-tellers, and their dishes and the techniques they use link together in a way that can tell the story of entire group of people. All it takes curiosity, a pointed question or two and a willingness to listen to unearth that juice. Toward the end of the interview, he described how his relationship to food and the act of eating has evolved. When he eats something now, he said, he thinks about the story behind it: Who made this, and why? Where did this come from, and why was it made this way? He gave the example of coq au vin, chicken stewed in red wine, and explained how that dish was probably “invented” by a poor farmer who didn’t have much to eat besides a really old hen and some farm wine. So he threw them together in a pot and left it over a low flame, hopeful that when he came back eight hours later he would find something edible to eat. So many of my favorite Italian dishes were similarly born out of scarcity and a quiet desperation to transmute nothing into something. With that context in mind, reading a recipe for pappa al pomodoro becomes an experience that’s both didactic (this is how you make tomato and bread stew) and narrative (here is a story about a group of people who struggled to survive war, food rationing and dictatorship). Indeed it is food and the rituals we create around it that define our humanness. I am so grateful for this man’s voice and the stories he brought us about food and our shared humanness. I will miss it tremendously. I thought about what Bourdain said as I stared at a pile of garlic scapes in my vegetable drawer. Farmers snip away these shoots from the garlic plant so they don’t rob the plant of vital nutrients. Who thought to cook with them, and why? I never know what to do with the scapes, but I love the way they look, curly and gnarled like a tangle of long, arthritic fingers. I remembered reading somewhere about garlic scape pesto, which makes total sense. I used this recipe from The New York Times as a guideline. Take care to trim off the flower bulb toward the top of the scape and just process the long, thin stalks. I used walnuts where the recipe suggested sunflower seeds. Pistachios or almonds would also work. There’s no need to toast the seeds, as that would likely muddle the subtle, inspired garlic flavor. Spread liberally on toast, eat with eggs, dollop over a bowl of warm beans with yogurt, or eat it straight from the jar. Pulse the garlic scapes and nuts in a food processor to fine pieces, 30 second to a minute. Add the basil and lemon zest and pulse another 30 seconds. Stream in the olive oil in and puree to a chunky paste. Transfer the paste to a bowl and fold in the parmesan and a pinch of salt. Before serving add a squeeze of lemon juice. The thermometer reads 9 degrees, but Yahoo weather’s telling me it feels like -8 with the wind chill. Getting out of bed this morning was a Herculean task. This is where winter begins to feel like a contact sport, and I’m tempted to paint thick, dark lines under my eyes before braving the subzero temperatures. As winter runs its course, I find no shortage of weather-related items to lament. The simple act of walking the dogs becomes a perilous endeavor crossing sheets of corrugated ice and unevenly shoveled sidewalks. Daylight is fleeting and leaving the house for anything besides employment obligations feels impossible. I spent a couple years living in Texas and bypassing this season entirely. Right around this time of year, I was swapping my running shorts and tank tops for capri pants and t-shirts. I retired my winter jackets and lived my life ignorant of polar vortexes and massive ice sheets wreaking havoc for my neighbors to the north. While it was nice to run in shorts in January, I desperately missed the innate rhythm of the seasons. Prior to moving to Texas, I hadn’t given any thought to way they grounded me to time and place. Not having the months of snow and bitter cold as a touchstone left me feeling oddly unmoored, like a rowboat whose slip knot had come undone, leaving it floating aimlessly in the middle of the water, directionless and puzzled as to its current circumstances. This is the part of the year to turn inward, and I know this instinctively because I’m no longer beckoned to venture outdoors. There’s nowhere else to go, no more energy to exert. Stillness reigns. That simple truth brings me great comfort. Even the sadness I feel around shorter, darker days is somehow comforting. After all, who can stand to be up all the time? A little sadness serves to ground us in the reality of a human experience that expands and contracts like the ocean, constantly ebbing and flowing, adjusting and readjusting to the elements. When it’s this cold out, I can’t stand to eat cold food. My cooking leans heavily on the tenets that govern the all-mighty stew. Holding a warm bowl of it in my hands after a long, exhausting day braving the elements serves as a spiritual salve. My cold hands tingle as they grip the warm bowl, and the ice that’s encased my chest all day slowly begins to thaw. Just like that, spring doesn’t seem quite so far away. This recipe is a stroke of culinary genius. The base is a simple soffritto of onions, carrots, celery, garlic, chili and rosemary that’s married with some rendered pancetta then stained with a hearty spoonful of tomato paste. Add to that some cooked white beans, some of their cooking liquid, and some small blanched pasta and some of its cooking liquid, and you get a heavenly bowl of Italian comfort food. A big hunk of crusty bread and some warm tea to wash it all down and you’ll forget all about the artic freeze bearing down on the landscape on the other side of your windows. *Note that you can use canned chickpeas for this but the result will be duller and less robust. That’s because some of the bean cooking liquid (a flavor explosion all its own) is added to the stew and imparts a tremendous amount of flavor. That being said, if time is of the essence, go with canned beans. Just remember to rinse them thoroughly as the canning liquid can impart an off flavor. Soak the beans overnight in plenty of cold water. Drain, place in a pot and cover with at least two inches of cold water. Bring to boil then turn down to a simmer. Skim the surface of any scum. Add the halved garlic head, the aromatics and a large glug of olive oil. Simmer until the beans are tender with a slight bite in the center, 45 minutes to an hour depending on the type and age of the bean. Put another large pot of water on to boil the pasta (don’t forget to add a liberal amount of salt to your pasta water). Meanwhile, in a 4-qt soup pot, add a small glug of olive oil and the pancetta. Cook on medium heat until the fat is rendered and the pieces start to crisp. Add the onion, carrot, and celery and sweat the vegetables on medium-low heat until softened, about 15 minutes. Make a small well in the center of the pot, add a little more olive oil and to that add the garlic, rosemary, and pepperoncino. Cook for 1 to 2 minutes, then add the tomato paste and cook for another 30 seconds. Add the canned tomato and Parmesan rind. Season with salt and pepper. Once the beans are finished cooking, add them to the stew along with about 1 cup of the bean cooking liquid (you want the stew to be fairly loose at this stage as the addition of the pasta starch will thicken it slightly). Now add your pasta to the boiling water and cook for half the time that the package indicates for al dente (you will finish cooking the pasta in the stew). Drain and save 1 cup of pasta cooking liquid. Add the par-cooked pasta to the bean and soffritto mix and cook on medium heat for another 10 to 15 minutes to finish cooking the pasta and bring the flavors together. Adjust the thickness of the stew with pasta water and/or more bean liquid as needed. Serve with a generous glug of fruity olive oil and a couple spoonfuls of Parmesan cheese. Chili oil is also a delight – and cleans out the sinuses! I love potatoes. They are the workhorse of any great kitchen. Delicious on their own, they’re always a warm and generous addition to soups, stews and curries. Quietly elegant, endlessly versatile, potatoes possess all the most desired traits of an ideal dinner guest. You would be hard-pressed to get bored with a pantry stocked with potatoes. Here are a few options: Shredded and pan-fried, sliced thin and fried (hello, kettle chips! ), roasted, boiled, mashed, smashed, baked, twice-baked, triple-fried. Perhaps my favorite aspect of working with potatoes is their ability to naturally thicken soup, omitting the need for copious amounts of cream or butter. Watching a chunky mess of vegetables and potatoes floating in water transform into a smooth, velvety elixir as the VitaMix whirs feels almost mystical. Here are two of my favorite iterations of potatoes: roasted potatoes with herbs and garlic and a delicious green soup. Note: if you ever find yourself in a situation where you’ve over-seasoned a pot of soup (or anything else liquid-based for that matter), add a peeled potato and it will soak up the extraneous salt. In that vein, when you cook with potatoes, keep in mind they are quite dense and require a heavy hand in seasoning. I boil them in salted water that tastes like the sea. Blanch the potatoes in water that’s heavily salted (it should taste like the sea) for about five minutes. Drain the potatoes in a colander then put them back in the hot pot to dry completely for a few moments. Toss the potatoes (with gusto!) in a large bowl with the crushed garlic cloves, rosemary, sage, and lot’s of olive oil. You should see starch clinging to the potatoes and the sides of the bowl as you’re tossing. This helps the potatoes get crispy — a very important step. Lay the potatoes in a single layer on a sheet tray lined with parchment. Use two trays if necessary. Cook the potatoes to tender and crispy, about 30 minutes. Turn the oven up to 425 for the last five or 10 minutes of cooking for a nice brown crust. Boil a pot of water. Season it with salt and blanch the parsley for 30 seconds. Drain the parsley and immediately transfer it into ice water (this preserves the bright green color). Once cooled, squeeze the parsley to remove most of the liquid and set it aside. Meanwhile, sweat the leeks over medium heat in two tablespoons each of olive oil and butter. Don’t brown the leeks — if you see color start to develop before the leeks are softened, turn the heat down. Add the thyme and the garlic. Cook for 30 seconds. Add the sliced potatoes and the bay leaves. Cover with cold water. Boil, then turn the heat down to simmer until you can easily pierce the potatoes with a knife. Remove the bay leaves. Using a Vitamix, an immersion blender, or a blender, blend the soup base with the blanched parsley to smooth. Season with salt and serve with a drizzle of flavorful olive oil. You can also serve this soup chilled, which is especially delicious during hot summer months. Make an ice bath (one smaller bowl inside a larger bowl filled with ice and water) and chill the soup in an ice bath until it’s cold before transferring it to the fridge. Using an ice bath will help preserve the bright green color. The first thing I noticed when I stepped off the bus in Seville was the color. The blood red writing on the advertisement for an upcoming bull fight. The walls of bars and cafes painted canary yellow housing myriad bottles of sherry. A cloudless cerulean sky in January. Seville is a city of color. It’s bright and loud, the people warm and effusive. I lived there during a semester in college and was immediately swept away in the city’s vibrancy and verve. I was fortunate enough to live with a Spanish family. My host mother, Nani, and her three grown kids took me under their wing and helped me become fluent in Spanish. They educated me on the intricacies of dialect, patiently explained the history of the Spanish civil war and the ensuing decades-long dictatorship, and taught me how to eat like a Spaniard. That brief stretch of time marked my first extended foray into a culture that wasn’t my own, and I relished being able to go undercover and discover a whole new set of mores and customs that weren’t my own. I happily adopted caffe con leche into my morning routine and ate huge lunches followed by long, lazy siestas. I stayed out absurdly late at flamenco shows and discotecas, sweaty, buzzed and alive. Unsurprisingly, the food was my favorite aspect of Spanish culture. Gazpacho and tortilla espanola was my favorite lunch during the late spring and summer months. The ice-cold tomato-based soup punctuated with the sharp zing of raw garlic and sherry vinegar was the perfect antidote to the inescapable heat. Spanish tortilla is a confusing name for a very thick omelette, usually with onion and potato. Gazpacho has many different iterations, but Nani’s remains my favorite. Her’s was a stripped down version, basically just ripe tomatoes pureed with a few other vegetables, a healthy dose of sherry vinegar, and an abundance of olive oil. Served with tortilla espanola and crusty bread, gazpacho has an almost Proustian power over me; it sends me right back to scorching late spring evenings circa 2006. Puree the vegetables with the vinegar and couple large pinches of salt. Stream the oil in as the motor runs to emulsify the oil into the mixture. Add the oil until you start to see the soup change color and it coats the roof of your mouth pleasantly when you taste it. You may need to add more salt and vinegar; taste and judge accordingly. Serve with another drizzle of good olive oil and lot’s of crusty bread. Note that as this sits in the fridge, it will start to separate. Stir well or blitz it with an immersion blender to re-emulsify before serving. A VitaMix works well for this recipe to attain that velvety smooth consistency, but an immersion blender or regular blender will work in a pinch. I don’t mean to sound patronizing. I realize my response may be off-putting coming from a professional cook. Of course it’s easy for me — I do it every day. For someone who avoids cooking the way I avoid doing my taxes — and I really avoid doing my taxes — that response probably doesn’t ring true. I have this quote from Julia Child on the back of my business cards: “You don’t have to cook fancy or complicated masterpieces — just good food from fresh ingredients.” I truly believe that good cooking at its core is a simple affair. Simple doesn’t always mean easy and rejuvenating. Anyone who’s ever cooked Thanksgiving dinner knows how tiring it can be, and yet it’s worthwhile. I’m never sorry about making the decision to cook rather than ordering a pizza, although there’s always a time and place for pizza. One of the best ways to incorporate more cooking into your life is to learn three or four skills well enough that you don’t need a rely on a recipe to make them. My friend Mary is a doctor and she’s really good at saving lives, but she’s not about to star on Top Chef. That said, she can make delicious black bean burgers, pasta salad, and peanut butter chicken salad from memory because they’re recipes she grew up eating. Making vinaigrette is a great example of a simple skill that, once mastered, will open up a new world of opportunities and ideas of what to serve for dinner. Plus it doesn’t require you to turn on the stove. The general rule of thumb is one part vinegar to three parts oil. That could mean one tablespoon white wine vinegar with three tablespoons of olive oil shaken up and poured over lettuce. Or you could get more creative using different acids, different fats (buttermilk! ), adding zests and other flavoring agents like soy sauce, miso, mustards, herbs or different spices. The possibilities are endless, and they all build off that basic ratio. Keep in mind that vinaigrette doesn’t have to be limited to dressing salads. I like to cook farro in salted warm and season the warm grain with lemony vinaigrette before adding a bunch of cooked veggies. Fry an egg and pour a tall glass of Chablis and you have yourself a lovely little dinner. If you like things more acidic, add more vinegar. As you continue tasting and practicing, you’ll develop an intuitive sense that will tell you what to add in order for it to taste balanced. In the meantime, happy cooking. Macerate (a fancy word meaning soak) the shallot in the vinegar with pinch of salt for five minutes. This smoothes out the harshness of the raw onion flavor. Add the honey and dijon. Pour the oil over the vinegar mixture and shake up the jar. Alternatively, whisk the oil into the vinegar mixture in a slow, steady stream. Add a couple cracks of black pepper and a couple pinches of salt. Taste and adjust the acidity, oil, and salt to your taste. It feels a bit early for tomatoes. In the Midwest we normally start seeing vine-ripened tomatoes in late August, sun-kissed, cherubic and plump. But well-tended greenhouses make access to delicious tomatoes a reality much earlier in the summer. I happened upon a few really good ones last week and jumped at the chance to eat them sliced raw with some coarse sea salt and olive oil just like we used to do in Rome. They were so flavorful it took my breath away: Sweet, acidic, firm yet easily yielding to the side of a fork. It left me with an oddly unsettling nostalgia for my childhood. My mother is a skilled cook and has always understood the art of restraint in the kitchen. During the summer, she adorned our kitchen table with heirloom tomatoes lined up like soldiers on a thin wooden plank. Dinner during the hottest parts of the year usually involved tomatoes in some unadulterated form. Two of her favorites are BLTs and tomatoes vinaigrette, a strikingly simple amalgamation of raw chopped garlic and balsamic vinegar poured over warm pasta and tossed with chopped tomatoes and their juices. I remember that pasta tasting like summer. While the pasta is cooking, roughly chop the tomatoes. Be sure to save the juices. Using a sharp paring knife, mince the garlic by hand then soak it in the balsamic vinegar for a few minutes. Drain the pasta. Transfer to a bowl and add the tomatoes with their juices. Drizzle the balsamic and garlic over the pasta as well as some good olive oil. Don’t be stingy with the oil. Toss by hand or use a large spoon to stir up the mixture to emulsify the tomato juices with the oil and the vinegar. Garnish with some Parmesan shavings and torn basil leaves.